The strongest survivors of sound. Coldcut need no introduction, being some of the first and finest artists to successfully work with samples and loops to forge their own styles of modern hip hop and dance music, Matt Black and Jon More are responsible for some of the digital generations finest musical moments, and whose label Ninja Tune continues to release some of the most cutting edge tunes currently available! 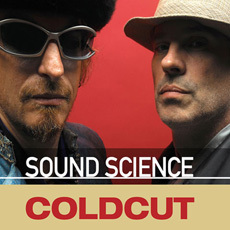 “For your delectation and musical pleasure we have pried open the Coldcut sample vault. Located deep within a secure facility at ninja hind quarters and sourced from over twenty years of electronic music creation, this library contains only the strongest survivors of sound. Digging deep within our repository of digital delights we have created a treasury of tools for your use. All the samples have been chosen with micro attention to sonic detail, a range of carefully produced elements that will have you creating new genres in minutes, rocking a party like you just don’t care, or making your bass face till it hurts ... its all here, liberated by Coldcut for you. “What Do I Get” The Buzzcocks once asked; well you get weighty kicks and snappy snares, happy claps plus slurpy hats, some credit crunching crashes, a good handful of snicky snacky percussion plus several rolls of tom toms. Combine this with a select group of tightly honed loops that go from weird groove through rare groove to future grooves. Chuck in plenty of Electronic parps, burbles and stabs from some of the obscurest vintage synthesisers we could find. Mix this with dash of Scratchy stuff, a large pinch of melodic topping, a drizzle of Vocal blips, a noisette of low slung sub and lashings of punchy noise. Rounded out with deep bass lines ... Sorry no cheese! Tech Specs: 620MB, including 37 Bass Loops, 166 Drum Loops, 111 Musical Loops, 41 Vocal/FX Loops, 8 Bass Multisamples, 126 Drum Hits, 21 FX, 11 Instrument Mulitsamples - all Royalty Free and ready for your productions.